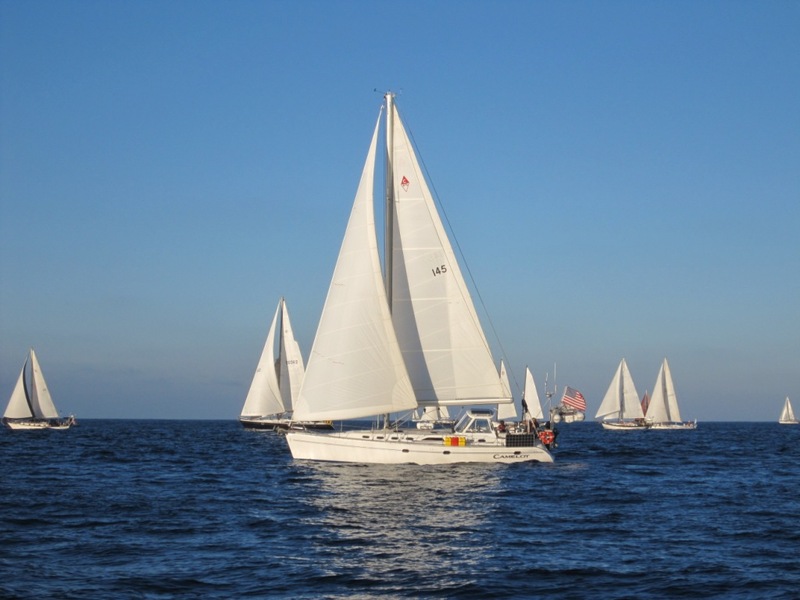 On 10-25-10 (Monday), we started the first leg of the Baja Ha-Ha Rally with 154 other sailboats. 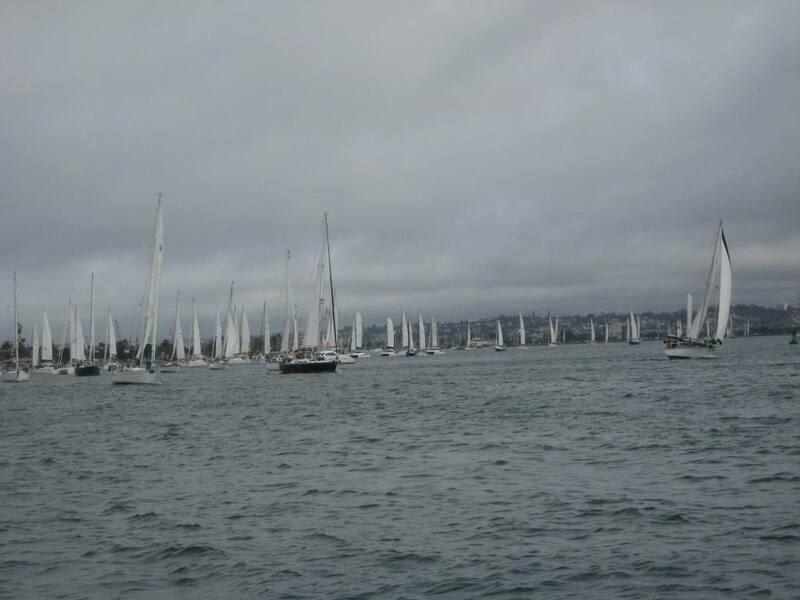 The Fleet paraded through San Diego Bay to a starting line between Shelter Island and a Committee Boat, which had dignitaries from both the US and Mexico on board. As we passed the Committee Boat, local Police and Fire Boats sprayed water arches and there was large media presence. Using the same shotgun that started the America’s Cup Races, the rally started at 1100 hrs PDT. We had good winds from the start and began heading towards Mexico. As the winds built, we started sailing to the seas and headed southwest, eventually ending up about 55 miles off shore. We continued down the coast of Baja. We had some very confused seas the first night and well into the second day, causing a pretty uncomfortable ride. Winds were strong, with gusts to 30 mph. At day break on Wednesday, the winds had dropped to 8 knots and we were finally able to raise the asymmetrical spinnaker for the first time. We rode the kite for about 5 hours, when the boom vang parted from the mast. This device holds Camelot’s boom up and basically keeps it from striking the solar panels. Due to the weight of the boom we had to strike the sails, secure the boom and motor the remaining distance to Turtle Bay. At this point we had sailed 304 NM and felt we could have sailed the distance, had the mechanical failure not stopped us. We arrived in Turtle Bay at 2030 hrs., on Wednesday 27th after completing a total of 374 NM and anchored in the dark. It was interesting, because about half the fleet had already entered Turtle Bay and the radar lit up like a Xmas tree. One of our friends saw my boat on A.I.S. and directed us in. We anchored without incident and finally got a good night’s sleep. The next morning we woke to sunshine and dolphins swimming around Camelot. Most of the first day was spent repairing the boom vang and boat clean up. boats) out to the fleet offering taxi rides or picking up garbage. It seems everything in Turtle Bay is $2, beer, taxi rides or garbage pick-ups. During our stay the fleet had a Pot Luck Beach Party. Although the weather is warmer (About 78 degrees), the water temperature was only 67 degrees. At 0800 PDT on Saturday Oct. 30th we started the second leg of the Rally from Turtle Bay to Bahia Santa Maria, a straight line distance of 232 NM. The start was slow, even with the spinnaker up we were only able to make 3 knots of boat speed in very light winds. 1 hour 40 minutes into the race, the Rally Committee decided that they would allow us to motor until we found better winds. After 8 hours of motor-sailing, the wind freshened and the race was back on. The wind was from the west to northwest and gave us some of the best downwind sailing I have ever had. At times, we saw as much as 10.0 knots of boat speed, and the boat was frequently surfing waves (Not too shabby for a 37,000 lbs. sailboat). The trip itself was pretty much a straight line of sailing with west-northwesterly winds, but with the coast falling away we ended up about 60 NM off shore. Total trip was 259 NM from Turtle Bay to Bahia Santa Maria. 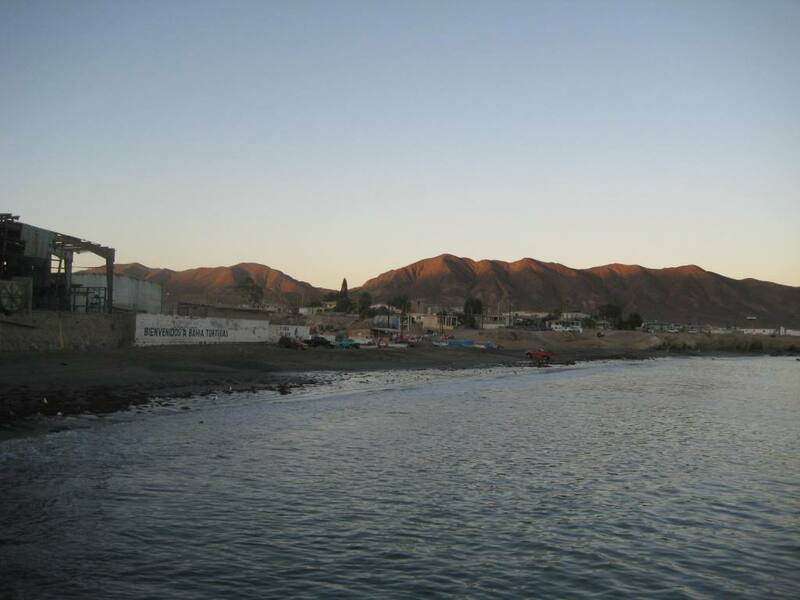 We arrived in Bahia Santa Maria at 2330 hrs, Sunday night (Halloween!) after 39.5 hours. We did break Sailing Rule #1, “Do not approach a new anchorage at night”, which Lori reminded me of as we approached the Bay and I danced with a Mexican Fishing trawler dragging nets. That was probably the most interesting part of the sail, since the Fishing Trawler Captain wouldn’t or couldn’t answer his radio and each time I turned to go around him, he turned towards me. After 15 or 20 minutes, I realized he was probably using purse or sane nets and spinning 1-2 mile circles, so I was finally able to get around him without incident. The entrance to Bahia Santa Maria is wide, but is littered with ship wrecks and rocks. Prior to entering the Bay, there had been reports of strong gusting winds, so I struck the sails and entered under bare poles. It turned out to be a blessing when we were slapped in the beam with 20 knot winds, gusting to 23 knots as it flowed over the hills just north of the entrance to the Bay. The wind in the anchorage was also strong for midnight, 15 knots gusting to 20, which made for a fast anchor set. As soon as the anchor went in, the boat set back and came to quick stop in 32 feet of water using 130 feet of chain. The crew was tired and turned in almost as fast as the engine quieted, but I stayed awake congratulating myself with a couple of cold beers. As I sat in the cockpit I could see a line of boats entering the Bay. 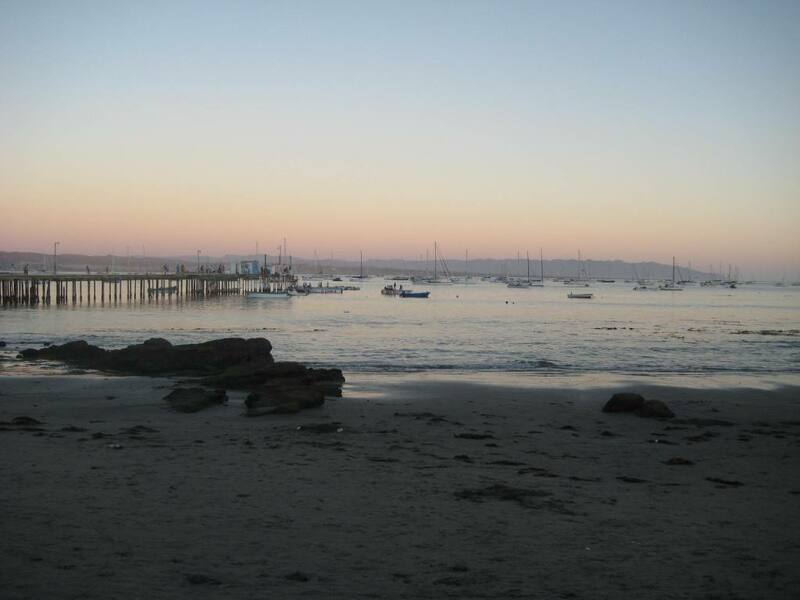 There was no moon, so the Bay was very dark and lit with Anchor Lights from the boats that had already arrived. At this point I realized that much of the fleet was behind us and trying to get into the Bay. For a short while I became the Vessel Traffic Service “VTS” for Bahia Santa Maria. I turned on my mast head strobe light and using the VHF radio guided boats into the anchorage, until about 0130 hrs., when I finally passed out. The next morning we woke to 10 knot winds and beautiful skies, Bahia Santa Maria is very isolated with only a few shacks that seasonal fishermen use. The land appears more desert-like and is very barren. The ocean water temp is about 73 degrees, up from 65 degrees at Turtle Bay. The air temperature is about 80 degrees right now, but the wind makes it feel just right. 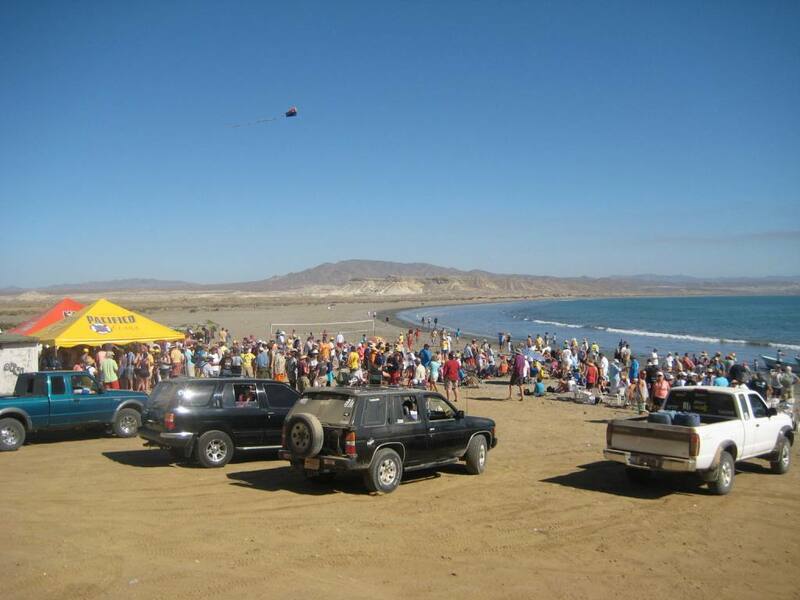 During our stay at Bahia Santa Maria the fleet was invited to a Beach Party given by the locals. In the middle of no-where they showed up with food, drinks and a band. It was crazy and fun. We shared sea stories with our sailing friends and got a chance to relax. 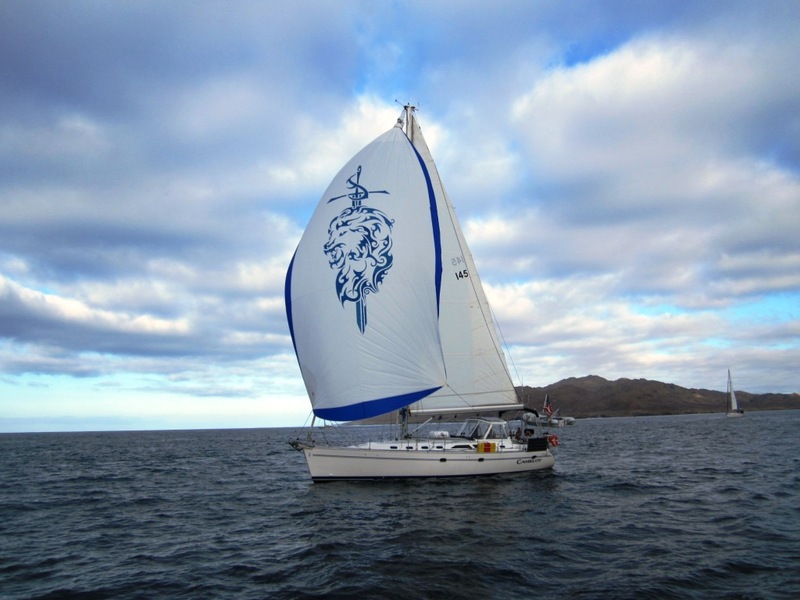 On 11-3-10, at 0700 hrs., Leg Three of the Baja Ha-Ha started from Bahia Santa Maria to Cabo San Lucas. The wind was very light during the start and after about 2 hours the Race Committee decided it was time to motor again. Later, the wind built and we sailed for a short time, which is a typical wind pattern for this area. Eventually we started the engine again and motored all the way to Cabo, reaching about 20 miles off-shore. During the overnight trip the weather began warming and it was the frst night I Tom sailed in shorts. The good weather was short lived as we received reports of high winds from the northeast were building. 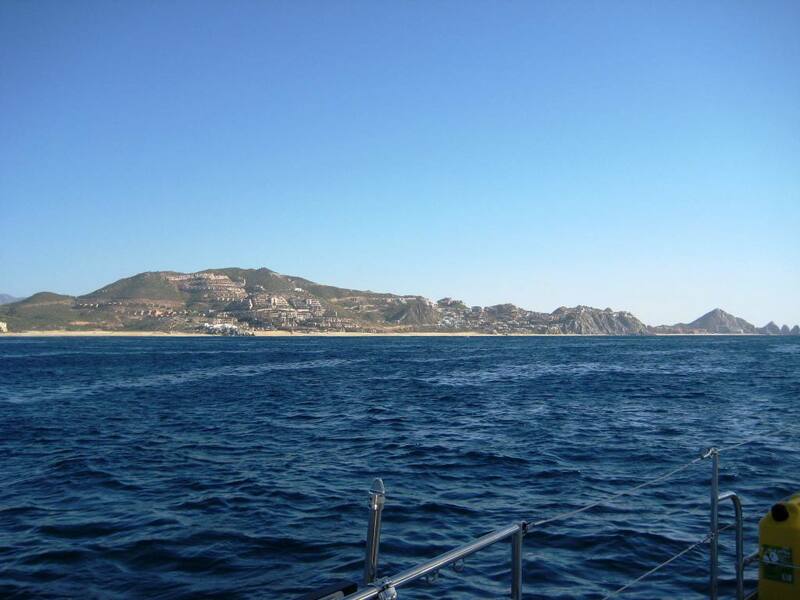 At that point we decided to take a slip in the Cabo San Lucas Marina, instead of anchoring in choppy seas. At 0830 hrs. 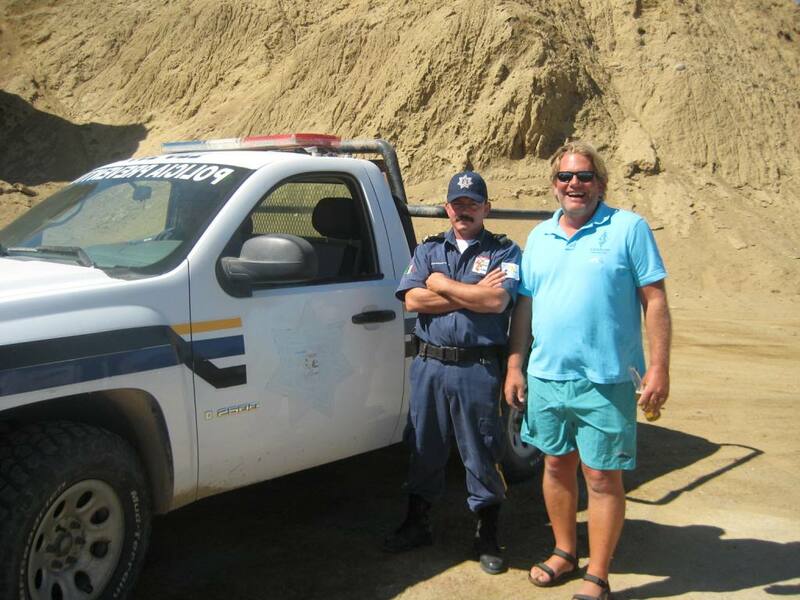 on Thu Nov 4th, we rounded the southern end of the Baja Peninsula and began the five mile eastbound trip to Cabo San Lucas. Shortly after rounding the Cape we were struck with gusty winds straight on the nose of the boat. We decided with such a short distance to go we would strike the sails and go in bare poles. As we entered the Marina, it reminded me of the canals of Venice, Italy. There was a huge cruise ship parked outside the Harbor and launches were busily ferrying passengers ashore. In addition, there was every kind of vessel known to man, from jet skies to luxury yachts coming and going from the harbor entrance. It was exciting and we were happy to get into our slip and secured. 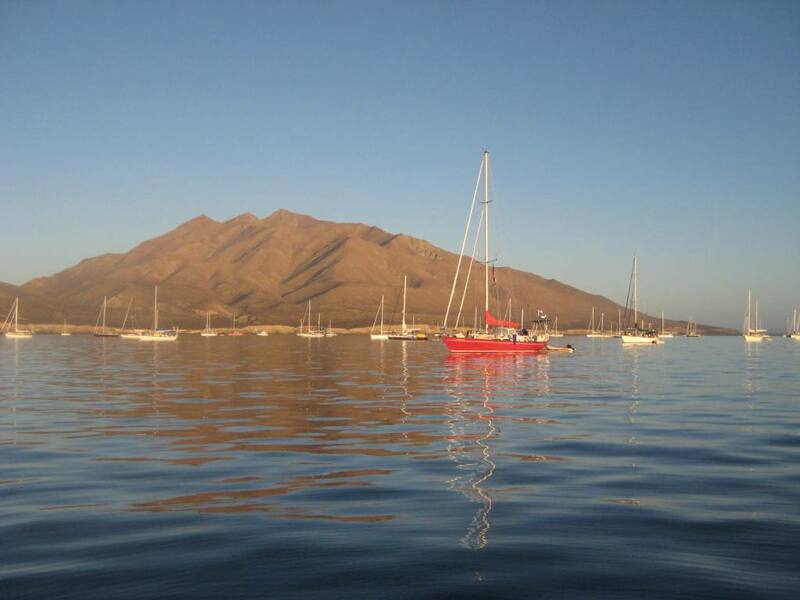 We will be spending three nights in the Marina, to allow the weather to pass and attend the various functions of the Baja Ha-Ha before moving into the anchorage outside the marina on Sunday.